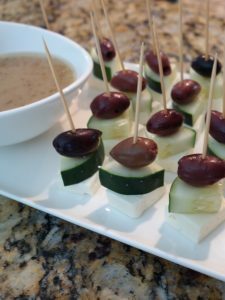 One of my favorite easy-to-make appetizers are skewers! They’re visually appealing, are super quick and easy to make and the variations on flavors are never-ending. This weekend my neighborhood wine group had a small summer kick-off cookout on Saturday. It had been a busy week so I was looking for something quick and easy to take. 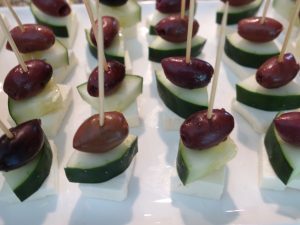 I came up with these Greek inspired feta, cucumber and Kalamata olive skewers with Greek dressing for dipping on the side. Assembly for a couple dozen pieces took 5 minutes or less. People commented that they looked fancy/festive yet they were so easy! Cut a brick of feta in half so that each bite will be about 1/4 inch thick (I used Mt. Vikos, 7 ounce size), then cut the two rectangles in to thirds by length and quarters by width (resulting in 24 small squares). Cut 6 cucumber slices again, each about 1/4 inch thickness and the quarter each round. Buy 24 pre-pitted Kalamata olives and stack away! I used Stonewall Farms Greek dressing for the dip. For more on entertaining, check out Four Pointers for Parties that Pop. Previous Previous post: KimoNO or KimoYES?